It's not too often that boxing see's two fighters facing off five times but that's exactly what Japanese fans have managed to see thanks to the hard hitting Riyo Togo (11-5-1, 9) and the determined Kimika Miyoshi (8-7-1, 3). The two women, who first fought each other back in 2008, came to blows for the fifth time as Togo looked to prove who was the better fighter. 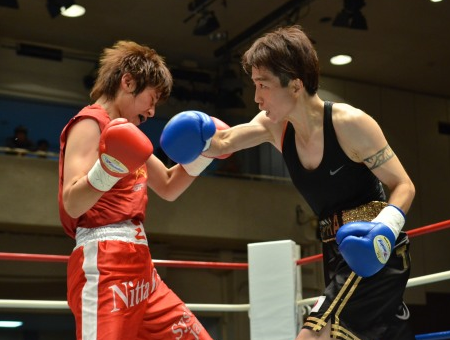 Although Miyoshi had beaten Togo just once from the four previous meetings she entered this bout as the defending OPBF female Bantamweight champion. A title she had claimed courtesy of a split decision victory over Togo back in February. Togo, with her eyes on reclaiming the title went in to this fight with the intention to stop Miyoshi, and whilst the bout didn't go the distance things didn't go quite how Togo would have expected. The bout was competitive from the off. Miyoshi's blows seemed the speedier but it was Togo's power that was the more eye catching and had seen her claiming most of the first 4 rounds on the judges scorecards. Sadly we never got the second half of the contest as an accidental injury in round 5 forced us to go to the scorecards early with Togo's early work being enough to get her the revenge Mioyshi that she had hoped for, and the OPBF belt. Despite the victory Togo may not be hugely happy about how she got it. Whilst she was winning the bout going in to round 5 she did suffer an accidental injury and forced the bout to the score cards, resulting in a fifth round technical decision. For Togo the victory will have meant a lot. It was her first victory following a gloves scandal against Mariana Juarez in their first meeting and it was a victory over her most notable domestic rival. For Miyoshi however this is proof that she's the lesser fighter and that her controversial victory over Togo in February was at least partly due to her being the home fighter.